Earl Collins: I used to hold my Daddy’s arm while he fiddled when I was two or three years old. I just kept it loose and tried not to bother him. Oh, he had some of me awfullest bowing you ever heard, he could do licks that no one else could. “Wrassle With A Wild Cat”– Miss Buchanan couldn’t even write it he’d make so many notes that she couldn’t get them in there and she’d write it just the best she could. He had quit playing for about 25 or 30 years till that WPA project came along and he needed the money. You know, they paid those fellas, they got a check regular. Roosevelt give them a check. They just played, dances or anything that come up. And Miss Buchanan taught them every day, this whole class of about 50 or 60 of them. Each of them, she’d tell them what it was going to be and she had her little motions, you know. And each one of them would turn to that page and she’d give– like Spade Cooley– one, two three, and everybody’d start. And they’d all play the same thing. Over and over. She taught them to read music, see. My father was the lead of the whole bunch. I’ll put him up at the top of the world. Not prejudiced because he was my father, but Clayton McMichen or Tanner or Eck Robertson, Georgia Slim—they couldn’t none of them beat him. In fact, I think he had them all topped. But Max and I is the only two that really teamed up. I set him on an apple box when he was six and showed film G chord, and he never made a bobble. He was my guitar man, and right today. I’ll take him above anybody. I stopped fiddling in 1950. I tried everything in the world. I tried every little gimmick that come along. I’ve been beat out of so much and cheated. Like I played the first television show that ever come to LA, in the western field—KFI. I played six weeks down there and never got one penny. Rehearsed three or four nights a week and then go down there and play thirty minutes. And a guy collected all the money and run off. And me and my brother, we was both working machine shop six days a week and playing two and three nights a week, sometimes four. We both just quit. I give both my two boys fiddles—I’ve had fiddles, guitars, banjos mandolins– and I wanted one of them, both of them actually to make a hoedown fiddler, follow in my old Dad’s tracks and in my tracks. But neither one of them was interested. Too busy running around doing something else, see. But in 1965 they come in to me one afternoon when I got home from work, said, ‘”Dad we’re going to learn to play rhythm on the banjo and the guitar: I said, “Aw no you don’t.” They said, “Yes, we do.” So that’s how it come that I take the fiddle back. I got the banjo and the guitar and the fiddle out, tuned then all up and then I’d play a tune. I’d show them the chords on the banjo and then show them the chords on the guitar. Then we’d pick up all three and we’d try. Sheet music looks like puppy tracks to me. Scales won’t mean nothing to you in hoedowns won’t mean a doggone thing. You just pick up the fiddle get a tune in your mind, and you work on that tune and you play it. You’ve got it in your mind and you know just exactly how it goes. That’s memory. But if you go to school and they teach you notes you’re not going to play hoedown, you’re going to play violin. It’s hard to get an old hoedown fiddler’s tone. There’s not too many around that has the old fiddler’s tone to me. It’s a touch on the strings and smooth bowing that makes a fiddler. It’s the beauty that you get out of a fiddle. As long as you’re in the chord, making your true notes, running your smooth bow—you’re playing the fiddle. Earl Collins was born in Douglass County, Missouri in 1911. 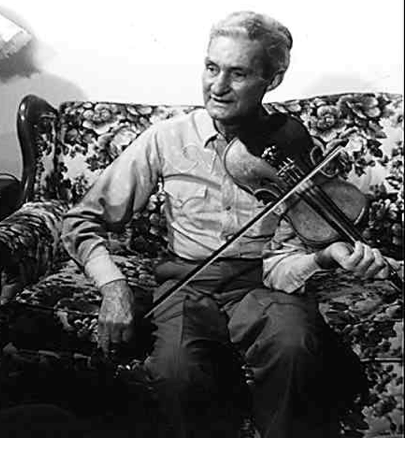 In 1917 his family moved to Oklahoma, where they sharecropped and Earl augmented their income by playing fiddle at square dances through the bitter early years of the depression. He married 1931 and he and his wife moved to Los Angeles, California in 1935 where Earl turned his hand to any lob he could get: hod carrier, truck driver, trash hauler, machinist, welder mechanic. He retired in 1969 because of his always fragile health. For years he tried to convert his skill as a fiddler into a money-making occupation. He never made it, and in 1949, he put his fiddle away and did not play again until 1965, when his sons persuaded him to take it up again. Earl’s extraordinary technique and musicianship made him a star on the old time fiddlers circuit in California, almost every weekend until his death in 1975 he played at one or another local contest or jam session. In the following, Earl tells his story in his own words, which have been excerpted from a series of taped interviews conducted by Barbara LaPan Rahm. “My grandfather fiddled, and his father fiddled. There’s been fiddling through the Collins’s since… I don t know how far the generation goes back. In the summertime my father always went out on the front porch and sat in a chair. I’ve heard people tell him “We heard you play fiddle last night, and we could tell just exactly what you was playing.” And they lived two miles away. That’s how far a fiddle would carry. Nice clear climate, you know. Those springs in Missouri that come out of the hills are colder than the ice cubes you get out of that box. That water is so cold that can’t walk in it: Clean pure. You know the waters so clear down there that it can be 25 feet deep, you can throw a nickel in and tell which is up, heads or tails. But it is mostly just hills and rocks. Just rolling hills just up one hill and down, up another and down. You know, Missouri is made put of rocks. I don’t care what kind of rock you want what size, you can find it. Rocks seemed to grow up out of the ground. We’d load them in the wagon and haul them off so that we could farm the land next year and next year there’s the rocks back up there again. It you could find five acres that you could put a little corn on or a little wheat or something, why, you were doing pretty good. They don t farm any more down there. When was seven, like I said, we moved to Wynnewood Oklahoma, stayed there a year and went to Shawnee. Shawnee’s an awful poor country. If it wasn’t for that Tinker Air Base up there, Shawnee would fold up the sidewalks and quit. See, they just farmed Oklahoma to death. Cotton and corn, cotton and corn, cotton and corn. The first thing you knew there was no fertile ground and you couldn’t make cotton or corn either. I picked cotton, hon. I would drag a sack 20 foot before I could find a boll of cotton: we’d be lucky if we got 1⁄4 of a bale an acre. That was before Roosevelt– ’32. You know how much I got? I got one day a month– $2.40. And that’s all the money I could make outside of this old fiddle. I’d play a square dance- play six or eight hours– and make 50 cents. I’d give Dad every bit of it but a dime and I’d go get me a soda pop and a candy bar. I started trying to play when I was about three or four. But l couldn’t reach the fiddle you know; my arm was too short. So Dad glued up this little old cigar box fiddle and made the little cut-outs, you know. And I played that for four or five years. I guess I was about seven when I got big enough to reach, make a true note. I was making them sharp all the time. And l had a good ear and I could tell I wasn’t reaching high enough: my arm wasn’t long enough. See, I was a two-pound baby. Clark4 was telling you the other day that you could turn a teacup over my head and put me in a shoebox. That‘s the truth. When I was five years old I only weighed 15 pounds. Mother always watched for him. She’d say, “I see Daddy coming, and you can put the fiddle up.” So one day I looked up, and Dad’s standing in the door. I was about seven. Oh. I was just fiddling the hell out of Eighth of January or something; I don’t know what it was. Oh boy, sure going to get it now. He said, “You’re playing pretty good: well, come on to dinner.” So I was so scared and shaky I could hardly eat, but he started talking to me at the table said, “You really like the fiddle, don’t you?” I said “Oh I really love that fiddle.” He said, “Well, I’II tell you what I’m going to do. I’m going to give it to you if you won’t fool it away.” And he said, ‘Why I been spanking you with that razor strop is to get you to play. Usually if you try to make a kid play, he won’t. Just like a hog, if he thinks you want him in the pen he won’t go in.” And that just the way he put it to me. And that’s the way I started playing the fiddle.